Preheat oven to 350 degrees. Line standard muffin tins with paper liners. Sift together both flours, baking powder, salt, and 1 tablespoon cinnamon. Divide batter evenly among lined cups, filling each three-quarters full. Bake, rotating tins halfway through, until a cake tester inserted in centers comes out clean, about 20 minutes. Transfer tins to wire racks to cool completely before removing cupcakes. Cupcakes can be stored up to 2 days at room temperature, or frozen up to 2 months, in airtight containers. To finish, combine remaining 1/2 teaspoon cinnamon and 2 tablespoons sugar. Using a pastry bag fitted with a large plain tip (Ateco No. 809 or Wilton No. 1A), pipe frosting on each cupcake: Hold bag over cupcake with tip just above top, and squeeze to create a dome of frosting, then release pressure and pull up to form a peak. Using a small, fine sieve, dust peaks with cinnamon-sugar. 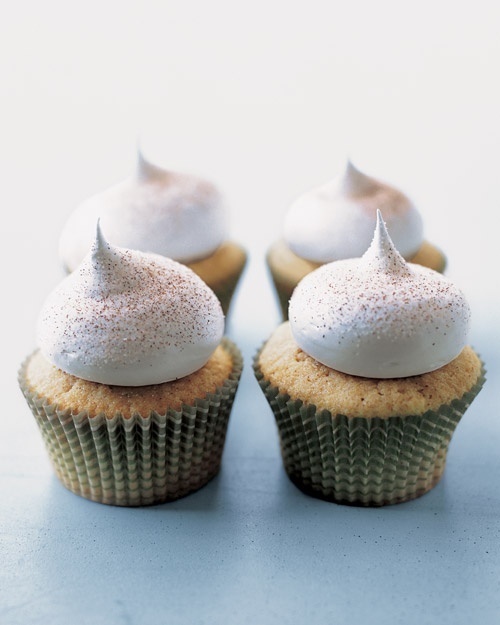 Cupcakes are best eaten the day they are frosted; keep at room temperature until ready to serve.